Mike Stobe/ Getty ImagesArgentina’s Lionel Messi grapples for the ball in the Copa American final against Chile. 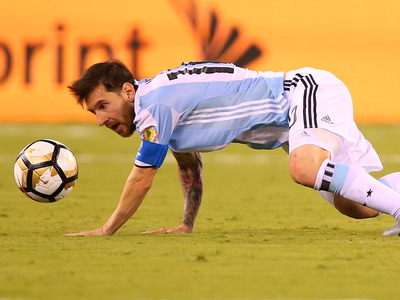 Barcelona and Argentina striker Lionel Messi — considered by many to be the greatest footballer currently in the game — has said he is quitting international football following his national team crashing out of the Copa America final against Chile after he missed a penalty. The news may surprise people given Messi’s relatively young age — he turned 29 just two days ago — but the statistics appear to agree with him. Since being with Barcelona, he has won eight La Liga titles and four Champions Leagues. But with Argentina he has only won a 2008 Olympic gold medal, and last night marked yet another defeat in a major final. The news comes after a tough year for Messi, who was recently trial for allegedly defrauding Spain of €4.1 million (£3 million; $4.6 million) in unpaid taxes.